This is a sad story and one I have to admit at first being slightly wary of telling. It’s a little more “modern” than I usually look at, but it is part of Blantyre’s history and despite it’s tragedy, I hope the retelling of it here will raise awareness for children today by reminding them just how fierce and dangerous the River Clyde can still be. The story and photos are lifted from newspaper archives of the day. It’s hoped that as the lasting legacy of these poor little souls, that nothing like this will ever happen again. The 19th February 1963 started off like any other cold, snowy Winter’s day, but was destined to end with tragic circumstances in Low Blantyre. A cold snap had frozen over the River Clyde and with sprinklings of snow in the area, the River that day proved an attractive playground for 4 young Blantyre boys. And young they were. Four year old David Law of 4 Knightswood Terrace, four year old Martin Mitchell of 7 Viewfield Avenue, five year old Peter Carney of 49 Knightswood Terrace and five year old James Pollock his neighbour at 51 Knightswood Terrace. All local to the Village are of Low Blantyre, the boys headed off to the nearby River adjacent to the Old Mill works. The boys had last been seen playing near the sweet shop in the Village, so nobody had any idea that evening, why they had failed to come home. The sweet shop was Tommy Morgan’s, a wooden hut situated on Station Road, directly opposite Viewfield Avenue at the bottom of the gable of the tenement at Ulva Place. Parents of the children raised the alarm quickly. It had been dark for some time and the alarm immediately sparked an all night hunt of Blantyre Village and the surrounding area by villagers, the parents and their families and of course the Police. During the search numerous small footprints were observed in the light snow, leading down to the water’s edge and it is here that the search turned it’s attention to. When the light returned on the morning of Wednesday 20th February, the weary searchers made a grim discovery. 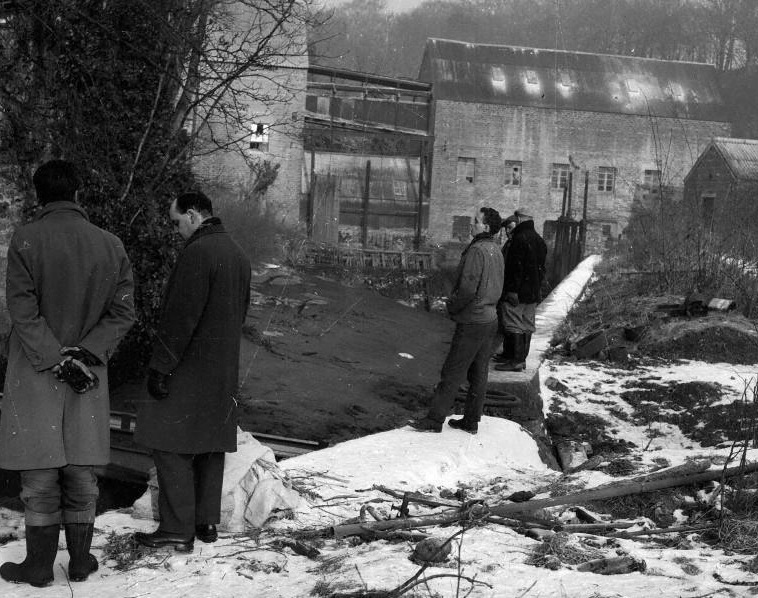 The poor little lifeless body of four year old David Law was found in the partly frozen lade, adjacent to the old Mill buildings. The person who discovered him was an uncle of one of the other boys, which must have been horrific. A picture was emerging that was likely the story would end with further tragic circumstances. The lade was drained but no other bodies found in that location. Sadly though, Police frogmen , now diving to search the river bed in freezing temperatures found the body of Davids friend, five year old Peter Carney around 200 yards upstream, immediately below a 15 foot hole in the river ice. At this point, foul play was ruled out and the Police issued statements saying that the boys had drowned, falling into the river after falling through thin ice. The search continued into the next day when a thaw set in and eventually uncovered that all four little boys were dead. This awful tragedy hit the community hard. Three of the boys were from the one street and found in the lade beyond the sluice gates. James Pollock’s body was never found. Services were held in their memory. The story is told with the utmost respect for anybody still connected to this sad event and is only told to ensure it can never happen again. All Blantyre parents should make their children aware of the dangers of playing near our local Rivers.